As someone who works in customer service, dealing with children and their parents day after day, I witness and experience my fair share of rudeness; it just comes with the territory. For the most part, I bite my tongue (I’d still like to get tipped, ya know?) but it really amazes me how many people lack common decency. Lately I’ve been interested in purchasing a book on manners and etiquette because I really believe that a good dose of manners and politeness can either fix or prevent most of the bad things that happen in the world. I browsed the selection on Amazon, only to find that the books I coveted the most were quite expensive. I happened to read some positive reviews for Miss Alkon’s book, but decided to hold off on buying any books until I could decide which one I wanted. A couple of weeks later, I went shopping in my local used-book store, and there was her book, sitting on a shelf for a mere $5! I immediately snapped it up along with a few other items. 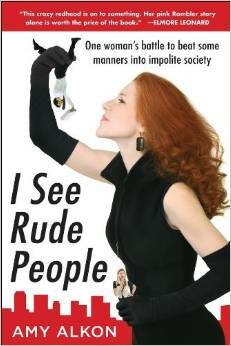 I See Rude People is a collection of anecdotes from Amy Alkon’s personal and professional life. She works as an advice columnist and blogger, so she’s experienced her fair share of anonymous (and not so anonymous) hate mail. She’s also been victim of a surprising number of car-related crimes, from getting her car stolen, to getting her other car smashed in a hit-and-run. Any time she witnesses or experiences rudeness, she takes it upon herself to lead a one-woman crusade against impolite people, creating consequences for behavior that often goes unchecked, and she encourages her readers to do the same. Amy Alkon has a really biting sense of humor, and you can tell that she is an experienced writer by the way she tells each of her stories. Although her car stories were both outrageous and entertaining, I didn’t understand their place in the book. I understand that maybe if her car thief had any manners, he probably wouldn’t have stolen to begin with, but it seemed like her problems had more to do with jumping through the hoops of the bureaucratic processes she had to go through to recover her car and less to do with good or bad manners. I also thought some of her jokes were made in bad taste. At one point, she makes a Hitler joke, but justifies herself by saying she’s Jewish so it’s okay. I disagree with that mindset in general. Later, she compares searching for parking to the battle in Fallujah, a pretty extreme and inappropriate comparison in my opinion. I also found it disconcerting that she found it necessary during two of her anecdotes to describe the race of the impolite person (and in one case a bystander) she encountered. In pretty much all of her other stories this fact went unreported, but in the two instances I mentioned above, she felt it necessary to point out that they were Asian, first calling one “a skinny, bespectacled, little Asian guy” (as if his race goes to further prove her point that he was wimpy looking?) and calling the other “Kim Jun Pinot Grigio” (at worst, comparing one rude Asian man in the wine aisle that she guessed might be Korean to one of the world’s most egregious violators of human rights, the North Korean dictatorship, and at best, dubbing this man with a generic-sounding Korean name to stereotypically racialize him). Towards the end of the book, she writes another anecdote about how she received backlash after writing a blog post she made about a black woman who got killed during a SWAT team drug raid because she (Alkon) was white, and made it a point to say that she is not racist. Frankly I find it suspicious whenever anyone feels it necessary to explicitly state that about themselves, because your actions should more than speak for themselves, but maybe that’s just me being overly critical. While it was a (relatively) funny read and I liked a lot of the points she made about cellphone abusers and bad parents, I was really turned off by some of her tasteless comments. I will probably be selling this book back to the used-book store.